Western Sydney's biggest food festival is back for the fifth year in a row and all are invited to come and enjoy the day's activities and many options of food to eat! For this free community event, this year's theme is 'Local Heroes'. The event will feature all local chefs across Western Sydney showcasing their signature dishes and with over 40 stalls of varieties of food and beverages, you're going to want to come to this event on an empty stomach! Not only will you get to stuff your face with all the delicious food on offer, you will get to learn from celebrity chef Paul West (Lifestyle Food's: The River Cottage) and the 2011 My Kitchen Rules winners Sammy & Bella, some handy cooking tips that could turn you into a full blown 5 star chef. For the kids as well, there will be a pizza making workshop running throughout the day and plenty of activities for the young ones to enjoy themselves. Another fantastic instalment of the day will be the focus on "Make, Eat, Grow". As the name suggests, it will be an informative part of the day about home-grown ingredients and their use and the event will be showcasing a delicious array of edibles, beverages and produce all from local Western Sydney. 'Gardening Australia' (ABC) will have their very own Costa Georgiadis featuring on the day who will be presenting a number of sustainable gardening demonstrations to fill you in with all the information you would need to start up your very own ingredients garden. The day isn't all just about food and presentations, there will be plenty workshops to get involved in during the day for both adults and kids. Specifically for the adults, there will be a microbrewery filled with a variety of craft beers to taste & enjoy. Contestants from this year's The Voice will be contributing the background music for the day. For the little ones, there will be a Kids Zone offering amusements and rides, face painting, a petting zoo and also a 'Kids Discovery Trail'. Parklands Food Fest will be a day for all to come and enjoy the gastronomic foods, beverages and activities that have been planned out. The entry to the Parklands is located at Lizard Log Amphitheatre in Abbotsbury is admission is completely free. 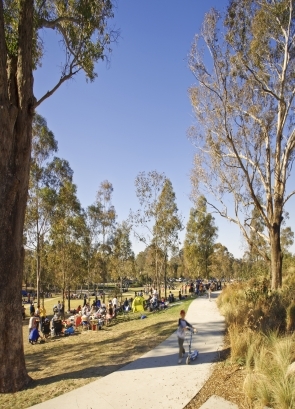 There is plenty of parking available and there is disabled access for the Parklands. Mark the date, Saturday the 17th of September, and enjoy the bounty that awaits!